This book is the first comprehensive study to respond to the ongoing debates on political sciences’ fragmentation, doubtful relevance, and disconnect with the larger public. 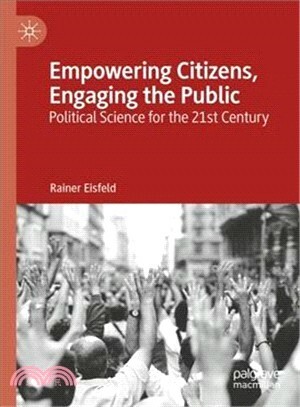 It explores the implications of the argument that political science ought to become more topic-driven, more relevant and more comprehensible for "lay" audiences. Consequences would include evolving a culture of public engagement, challenging tendencies toward liars’ rule, and emphasizing the role of “large” themes in academic education and research, the latter being identified as those areas where severe democratic erosion is occurring – such as escalating income and wealth disparities pushing democracy towards plutocracy, ubiquitous change triggering insecurity and aggression, racist prejudice polarizing societies, and counter-terrorism strategies subverting civil liberties. Political science needs to address these pressing problems ahead of other issues by in-depth research and broadly accessible public narratives, including solution-orientated normative notions. This need provides the final justification for evolving a discipline where problems would take priority over methods and public relevance over sophisticated specialization. Rainer Eisfeld, Professor Emeritus of Political Science at Osnabruck University, Germany, taught at UCLA as a Visiting Professor. He has represented IPSA’s research committees on the IPSA Executive Committee, and has also served on the Board of Trustees of the Buchenwald/Mittelbau-Dora Concentration Camp Memorial.